The Minox Agent M DSC DigitalSpyCam is a tiny digital camera - only 3.14″ x 1.14″ x 0.79″. At 5 megapixels. 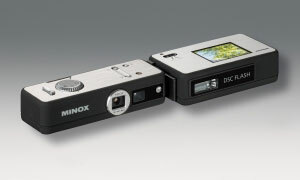 DSC is the name of the new mini MINOX model: Digital SpyCam. The bright viewfinder allows spontaneous, fast shots, even in critical light conditions. In twilight the integrated flash switches on automatically. In total these features make the new DSC a very sound optical notebook.